For more information on our full range of Accessibility products, call us on 01 452 4182 or email sales@switch.ie. Below are a selection of Cameo Systems supplied by Switch, however, for a full breakdown of the products carried by Switch, please call our Sales Office on 01 452 4182 to speak to one of our Cameo experts to determine the best solution for your needs. The Orbital RS2-TA is a simple one way disabled refuge and toilet alarm system. 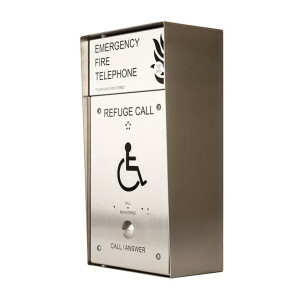 The combined master panel has a call indication for the disabled refuge and an alarm indication for disabled toilet. 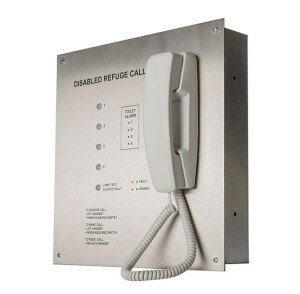 The master panel can answer or call out automatically to the disabled refuge location by lifting the master handset. Once connected a clear full duplex audio conversation can take place. The call is ended by replacing the master handset. The system outstation is radially wired in ’2′ core ’1.5′mm enhanced fire rated cable. The toilet alarm can be either wired to the disabled refuge oustation or master panel in a non fire rated ’2′ core cable. Battery support 24 + 3 hours. Fully compliant to BS5839 Pt9 and CE 2012 certified. With surface mounting back box. See also ORB-R-RS2-S for a Flush Mounted back box. The Orbital RS2 is a simple two way disabled refuge system. With seperate call indications for each disabled refuge location. The master panel can answer or call out automatically by lifting the master handset. Once connected a clear full duplex audio conversation can take place. The call is ended by replacing the master handset. The system outstations are radially wired in ’2′ core ’1.5′mm enhanced fire rated cable. Battery support 24 + 3 hours. Fully compliant to BS5839 Pt9 and CE 2012 certified. With flush mounting back box. Click here to view the ORB-R-RS2-FTechnical Specifiaction. See also CRT-SSF-R or CRT-SSF-L: Combined disabled refuge and fire telephone unit. Type A and B Flush enclosure. Click here to view the CRT-SSS-R Specification Sheet. Disabled refuge outstation. Type B. Surface mounted enclosure finished in stainless steel with a black screen print. Weatherproof with hands free communications for clear full duplex audio. A call is made by pressing the large momentary push button. This will illuminate the switch ring (Red) led, and initiate a conventional telephone call tone from the panel loudspeaker. 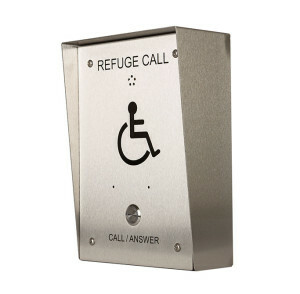 See also RCO-SS+FR-BB or FL-BB disabled refuge outstation Type B, Flush mounted stainless steel hands free unit. Click here to view the RCO-WR-R Specification Sheet. Flush mounted green hands free unit. Photo luminescent front panel, Braille identif ication, Vandal resistant, Induction loop, and Tactile text. Flush unit has a galvanised steel back box. A call is made by pressing the large momentary push button. 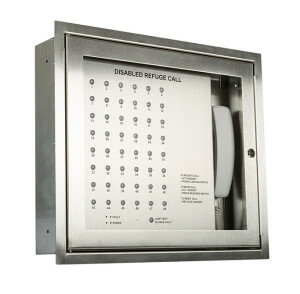 This will illuminate the panel mounted ‘call registered’ red led, and initiate a conventional telephone call tone from the panel loudspeaker. Click here to view the RCO-GB+FR-BB Specification Sheet. 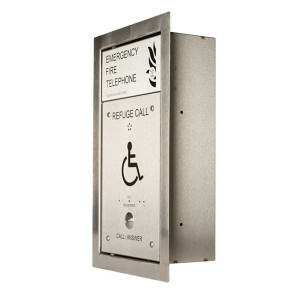 The Orbital RS4-TA4 is a four way combined disabled refuge and disabled toilet alarm s ystem. Stainless steel flush or surface enclosure with black screen print. 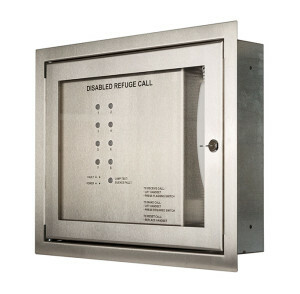 The master panel can answer or call out by pressing the seperate call switches and indications for each disabled refuge location. Group or all call can also be selected. Once connected a clear full duplex audio conversation can take place. The call is ended by replacing the master handset. The disabled refuge outstations are radially wired in ’2′ core ’1.5′mm enhanced fire rated cable or as a loop wired ’4′ core ’1.5′mm enhanced fire rated cable. A volt free changeover contact is provided for remote call in and fault reporting. A fire panel inhibit input is also fitted as standard. Battery support 24 + 3 hours. Fully compliant to BS5839 Pt9 and CE 2012 certified. Four individual blue toilet alarm LED indicators are combined onto the master panel. A simple two core cable should be wired from the disabled toilet PSU/Sounder unit to the nearby disabled refuge outstation. The refuge outstation back box is supplied with terminals for this connection. Click here to view the ORB-R-RS4-F-TA4 Specification Sheet. The Orbital RS8 is an eight way disabled refuge system. Stainless steel flush or surface enclosure with glass lockable door. 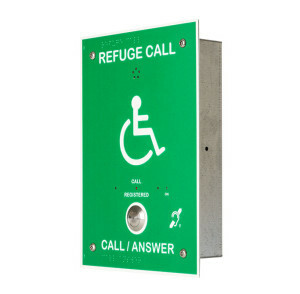 The master panel can answer or call out by pressing the seperate call switches and indications for each disabled refuge location. Group or all call can also be selected. Once connected a clear full duplex audio conversation can take place. The call is ended by replacing the master handset. The system outstations are radially or loop wired in ’2′ core ’1.5′mm enhanced fire rated cable or as a loop wired ’4′ core ’1.5′mm enhanced fire rated cable. A volt free changeover contact is provided for remote call in and fault reporting. A fire panel inhibit input is also fitted as standard. Battery support 24 + 3 hours. Fully compliant to BS5839 Pt9 and CE 2012 certified. Click here to view the ORB-R-RS8-F Specification Sheet. The Orbital RS48 is a forty eight way disabled refuge system. Stainless surface enclosure with glass lockable door. The master panel can answer or call out by pressing the separate call switches and indications for each disabled refuge location. Group or all call can also be selected. Once connected a clear full duplex audio conversation can take place. The call is ended by replacing the master handset. The system outstations can be loop wired ’4′ core ’1.5′mm enhanced fire rated cable. A volt free changeover contact is provided for remote call in and fault reporting. A fire panel inhibit input is also fitted as standard. Battery support 24 + 3 hours. Fully compliant to BS5839 Pt9 and CE 2012 certified. Click here to view the ORB-L-RS48-S Specification Sheet.